Just a neon sign, cloudy sky and moon, but what a transformation. 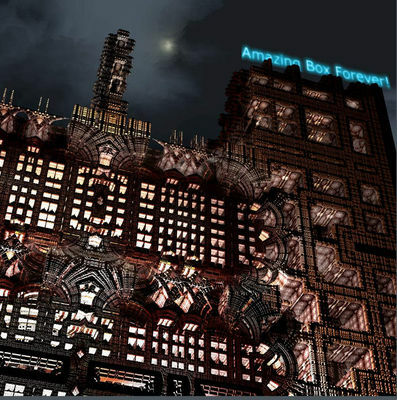 A number of 3d fractalists refer to having an “architectural style” and here you can really see what’s meant by that term and why it is such a natural one in the world of 3d fractals. Nice and subtle addition to an otherwise average mandelbox. ZZZ_spb really shines at this sort of thing. Another example of subtle but powerful. 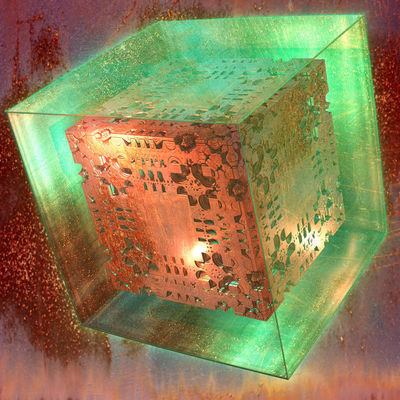 This is not a terribly exciting mandelbox but the clear box Mark put around it and especially the way he’s colored and textured it’s surface has transformed the simple image into something fascinating. I don’t think Mark was really trying to make something noteworthy here, just experiment with this inclusion feature of the program. But the final result is great. Made in Fragmentarium, a bold new program by Syntopia for making weird, terrifying things like this. Although, like Mark’s image above, I believe this image is something of a technical experiment rather than an attempt to create art in the strict sense of the word (and what does that mean? ), the result is something quite unique and almost humorous as well. 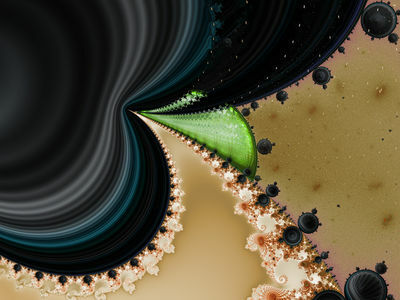 Humour in fractal art? Is this what ZZZ_spb’s hotel looks like in the morning? Well, it’s by lxh, another screen name I’ve been unable to decipher. Maybe’s that the idea behind these screen names. Someone ought to compile a list so we can at least decode them from time to time. 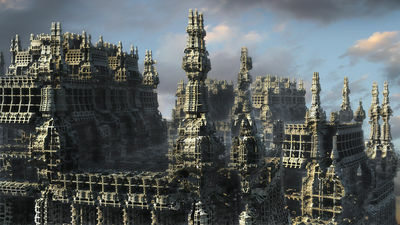 Description: This might be what we see – a foreign city or complex – but in fact it’s the virtual manifestation of thoughts, ideas and efforts of the fractalforums scene and at least stage of my personal fractal journey. DURING the whole of a dull, dark, and soundless day in the autumn of the year, when the clouds hung oppressively low in the heavens, I had been passing alone, on horseback, through a singularly dreary tract of country ; and at length found myself, as the shades of the evening drew on, within view of the melancholy House of Usher. Nice, California look. The sunlight reflects off the water and off the ceiling of the middle cavity; nice touch. It resembles those 3d Bryce images that incorporate obviously artificial elements and yet have been seamlessly wrapped in the environment around them as if they grew out of it –right there. 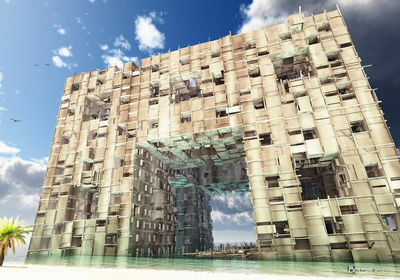 In fact, this menger sponge structure looks like a ruined or dilapidated tropical building. “Her mind is tiffany-twisted…” I see this as an extremely unusual coffee table and of course, the sort of thing that would only reside in a rather wealthy, luxurious kind of place. It’s an interesting “thing”. Made of glass; too delicate to be used and thus… tiffany-twisted. 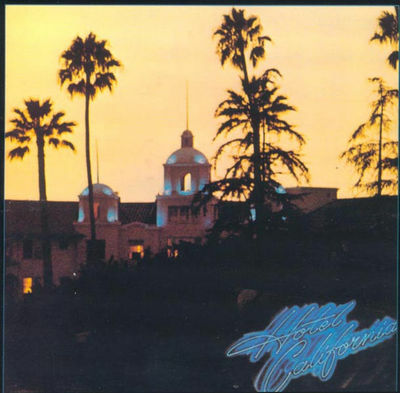 You know, if they had 3d fractals back in 76 when Hotel California came out, then they would have used them for the album cover. I’m assuming you know what an album cover is. 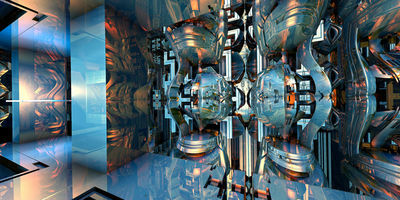 Mark’s image here uses reflection very well and creates images within the image –of itself! “Prisoners… of our own device” As always, if you want to get all the thrills this image has to offer, you need to click on it and see it full-size. Or check out the mammoth version in Mark’s Deviant Art gallery. 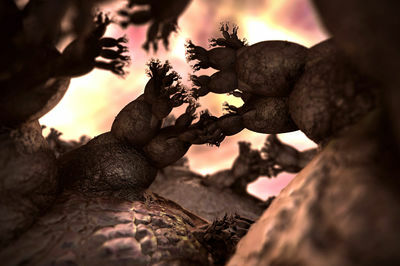 If you look closely you will see the rough, bud-like points of the mandelbulb. 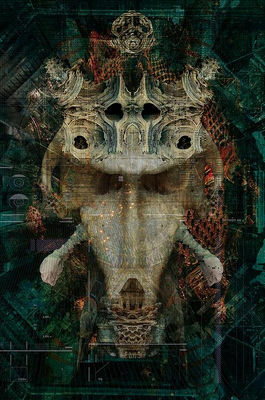 However, this is not really a 3d image as you might have guessed and has been creatively layered and other things to produce this beastly looking creature. 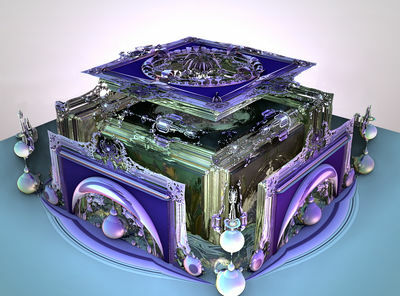 (Pressed mandelbulb?) As the title suggests, it’s a combination of various animal tissues –transplants. Xenotransplantation (xenos- from the Greek meaning “foreign”), is the transplantation of living cells, tissues or organs from one species to another. I like the symmetry. Symmetry can give a surreal feeling implying this macabre concoction has morphed into a coat-of-arms symbolizing authority and pride instead of revulsion and fear. “We You are programmed to receive. Simple album cover; just a neon sign, hazy sunset and some colonial architecture. Computers have changed a whole lot since then, but art is still the same.